The pre-adventures of Peter Pan continue, and they’re just as fun and fantastic in Peter and the Shadow Thieves as they are in book one. Peter chose to stay in Never Land with the lost boys rather than live with Molly and her family in London. But when he learns the Others (evil ones who seek to rule the world with the power of stardust) have tracked the huge shipment of stardust to the Asters, he doesn’t hesitate to travel to their rescue. But he and Tink have to stow away on the very boat that carries the Others. The old villain Slank is among their number, along with a new nemesis, Captain Nerezza, and a cold, raspy creature called Lord Ombra who controls people by stealing their shadows. Peter must help the Asters return the stardust to the heavens before the Others get ahold of it, but Ombra proves a much cannier adversary than any he’s yet faced. I’m really enjoying this series (again). Like book one, the sequel continues to tie well-known details from the classic story into new adventures. The new story explains the old one. In this case, Mr. Pearson and Mr. Barry take the shadow theme and give it a huge new significance. They also continue to exercise their superb talent for funny dialogue and keep their characters on the brink of disaster. I lose track of time in these books. Before I know it, I’m another hundred pages in. This one isn’t quite as violent as the first book, which featured pirates. Ombra is an entirely different kind of evil. A scarier, more serious kind of evil. Appearing in the form of a cloaked man, he glides around, oozing in and out of tight spaces. He is what nightmares are made of. The threat in this one is slower, less slapstick, and less violent, but more menacing. Still, it’s entirely appropriate for kids 10+. In fact, I don’t recall any profanities in this one at all. This time around, I realized that the authors gave James Barrie, the author of Peter and Wendy, a cameo appearance in this book. I didn’t catch it last time I read it, maybe because I’m accustomed to seeing his name written as J. M. Barrie. But he’s in here for a brief “ah-ha” kind of scene, along with a St. Bernard (remember Nana?). Very cute. I also want to mention the illustrations before I close out. They’re extremely well done–detailed black and white drawings (charcoal?) drawn on gray paper. Illustrator Greg Call does a wonderful job capturing the soul of each character in his expressions. They add greatly to the story. Must have missed your first review of this series. I love a remake on a classic. Sounds like a lot of fun. Peter Pan was always my favorite character. Ah, I forgot to put in links. I’ll do that. I enjoy a new spin on old favorites, too. 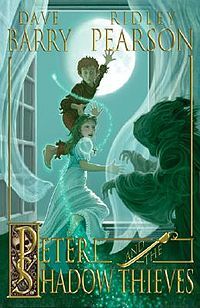 And this series prompted me to read the original Peter Pan (Peter and Wendy) for the first time. Can’t believe I never had before! I read the first book in this series and enjoyed it, but I haven’t read any of the others. Jim Dale reads the audio and he is a fabulous reader- so I am thinking of getting the audio of the 2nd book to listen to in the car. 🙂 Glad to hear it is a great story. These two manage to keep the humor and momentum going the whole series. They must have had a ball writing these together! I just read the original Peter Pan novel this week. I like this series better!